Back to school is literally right around the corner and that means we are busy getting ready to send the boys off to school. I can't believe I will have a 2nd grader and a 4th grader this year. EEK!! We love to shower our teachers with praise and gifts and to celebrate the start of the new year and we always bring something special when we meet the teacher for the first time. Just a little something to let them know we care and are looking forward to another great school year. For the past several years during meet the teacher night, I have grabbed a bottle of hand sanitizer, because we all know classrooms are full of germs, and gave to our new teacher! Of course with a cute little note saying something like Happy New School Year or something similar. This year, to make it extra special we headed to Office Max to see what goodies we can find to make our gifts one of a kind. Now, that my oldest son is entering fourth grade and will have more then one teacher, we have four gifts to make. With Expo Neon Window Dry Erase Markers, we were able to decorate some mini organizers with the word "supplies" and fill it up with Sharpies and awesome pens by PaperMate. 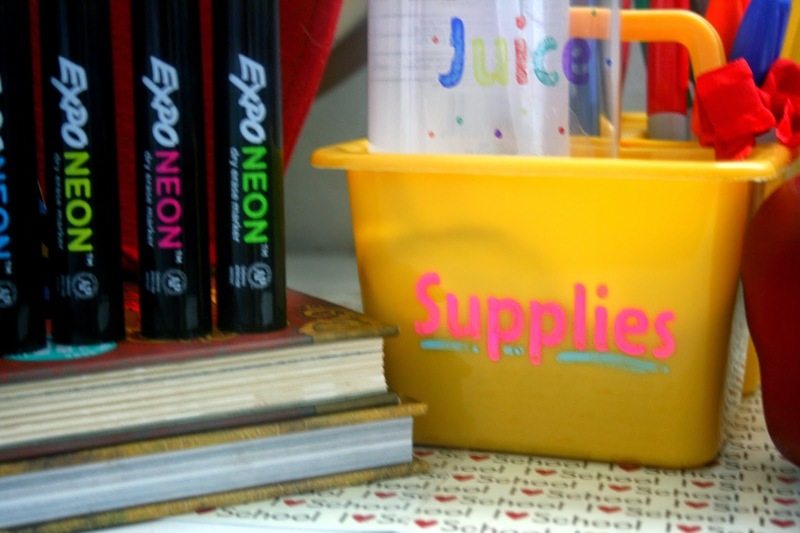 We love the Expo Neon Window Dry Erase Markers because it gives the look of a permanent marker or paint but can changed later when and if their teacher wants to use this for something other than supplies. Plus, the colors stand out and was so simple to use! Since its a dry erase marker, we were able to erase it when we made a mistake. Ooops! 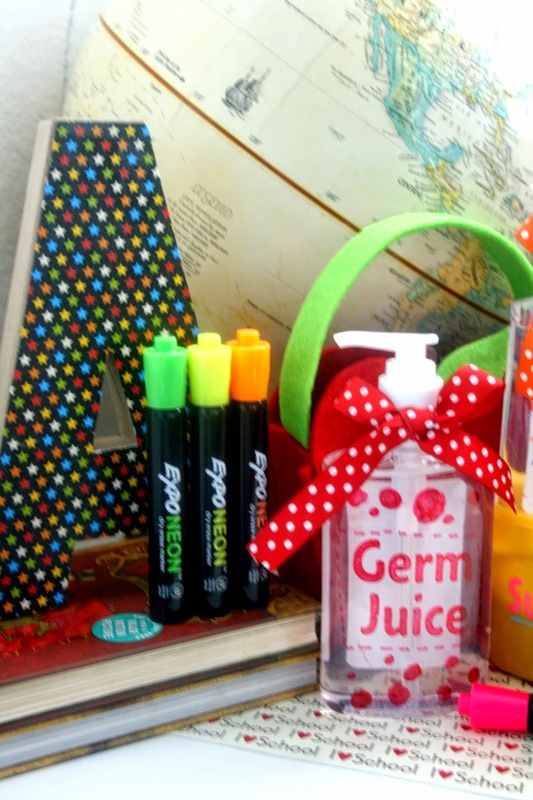 Of course the supplies caddie is a great gift in itself but, we really want to personalize our traditional hand sanitizers for our teachers. 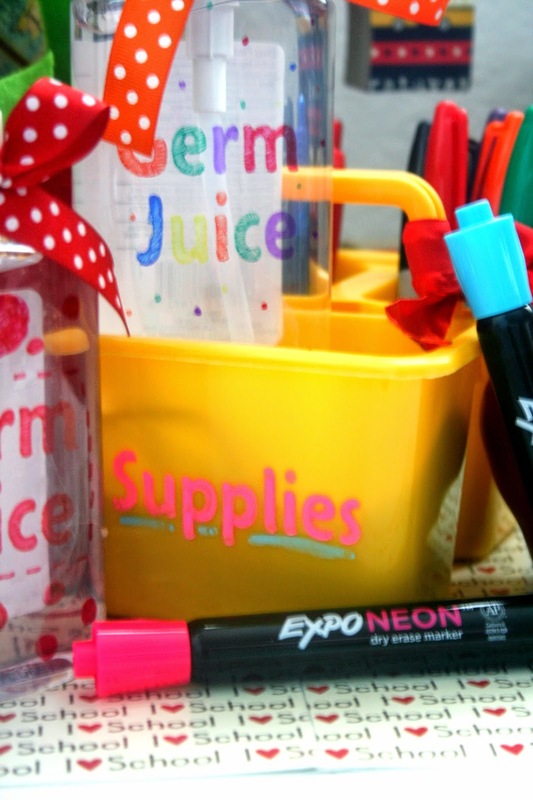 So, this year we used Sharpies to hand decorate each bottle front with "Germ Juice" to include in our supplies caddie. It was super simple and easy thanks to Sharpies. What are you waiting for? Head to the store and get started on your own back to school teachers gift! Love those bright colors! That "Germ Juice" is so clever! 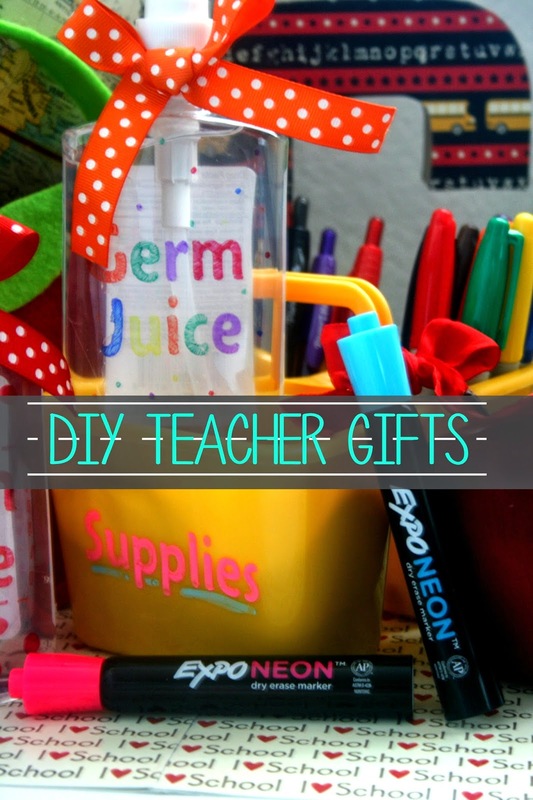 All fabulous ideas any teacher would love! Great idea! 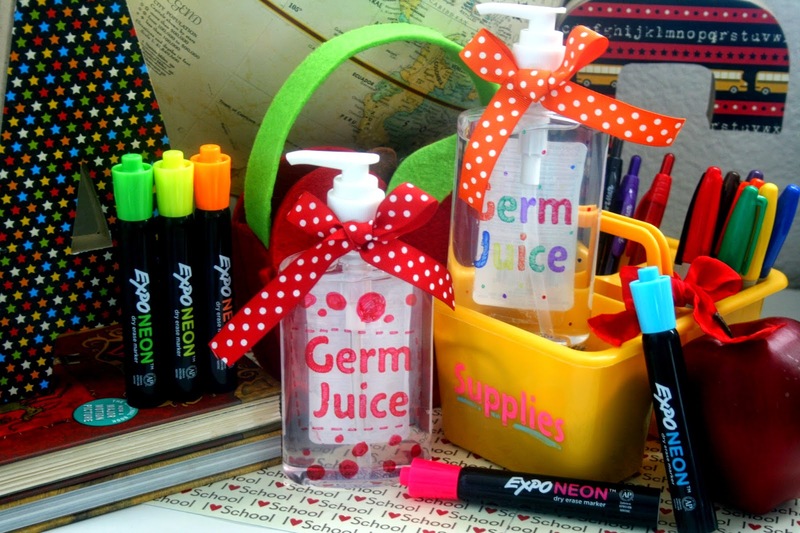 I love the germ juice - so cute! Any teacher would LOVE to receive this gift. 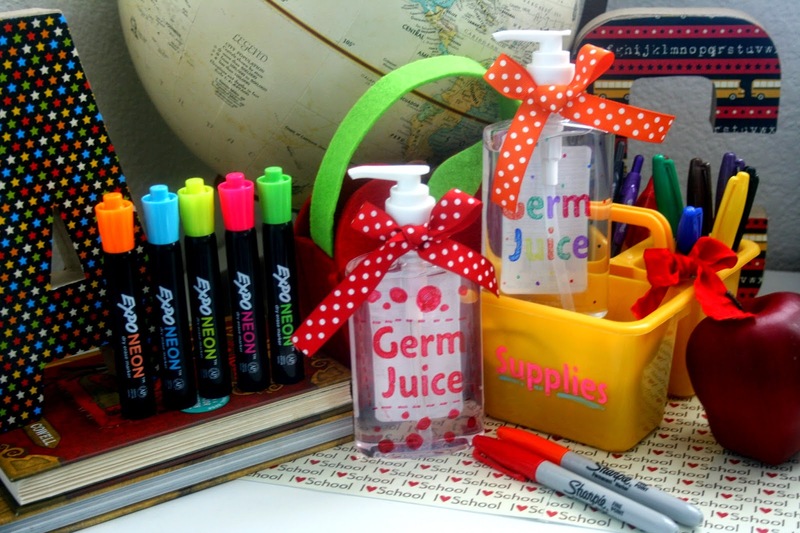 LOVE the germ juice!